It’s the excess gain in the system which is the real problem. That in turn forces you always to use the volume control over a very limited portion of its travel. What's needed is a way to reduce overall system gain without compromising sound quality and without major modifications to the equipment itself. When used with integrated amps (simply plug them into any input sockets, then plug the source component into the attenuators) the volume control will be two or three "hours" further round its range than it was before, giving better control at low levels and operating well away from the end stops. When used with pre/power amps, there is an added benefit. Although the attenuators can be used on the inputs of the pre-amp in exactly the same way as they would be used on an integrated amp (with the same benefits), alternatively they can be used between the pre-amp and the power amp to even greater effect. When used this way, not only is system gain reduced by 10dB, but the signal to noise ratio is improved by 10dB. This pushes the noise floor down enough to create an inky black silent background from which the music can emerge with better resolved fine detail and transparency. This applies to even very high-end and very expensive pre/power amps. So, if you recognise the symptoms of excess gain in your system, the Rothwell attenuators are the answer. Don't be put off by the fact that you could pay much more money for an audiophile tweak such as a set of spikes. These attenuators give real, measurable as well as audible improvements and are perfectly at home between pre and power amps costing as much as a family saloon, and for users of balanced equipment we now have a balanced version available. Both our RCA and XLR attenuators are available with 10dB or 20dB attenuation, and the RCA attenuators are now available as “source” attenuators. Source attenuators are designed with the input at the male end and the output at the female end and are intended for use one the output sockets of CD players rather than the input sockets of pre-amps. This can prove very useful for owners of Naim equipment. Where Can I buy Rothwell Attenuators? 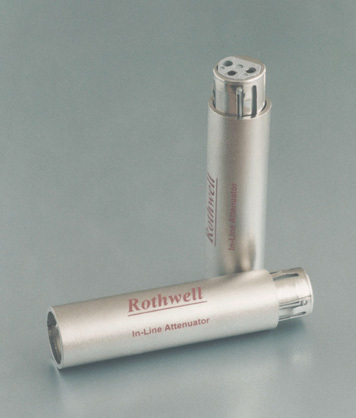 The In-line Attenuators are currently Rothwell’s most popular product and are available from numerous retailers and dealers around the world (click here for a full list), and are also available from the online shop. Payments are handled by Worldpay - one of the world’s leading internet payment services - so you can be sure your transaction is secure. UK VAT (value added tax) is charged on sales within the European Community but is automatically deducted from sales to any country outside the EC. The price will be converted to your local currency automatically by Worldpay. Your card details are not sent to Rothwell Audio Products at all. Your transaction is handled solely by Worldpay. Your package will be sent by airmail and will arrive within a week - often quicker. It is very easy to buy a pair of attenuators. You don’t have to register with anyone or subscribe to anything - you just need a credit or debit card. How Do The Attenuators Work? For a detailed technical explaination of how and why the attenuators work, click here . Balanced (XLR) attenuators are also available. These are specially designed for audiophile line level balanced equipment (microphone attenuators look similar but are designed for much lower impedances) and use gold plated contacts and precision resistors, hand-wired with silver plated oxygen free copper wire, insulated with PTFE. The attenuators cost £39 and can be purchased from any of our UK and international hi-fi dealers (full list) or from our online shop.